John Teo of NSTP Is A Scumbag!! I read one article from my friend's Jeff's blog. I really missed the newspaper especially NSTP on Christmas. Sorry maybe i'm more into The Star, New Sabah Times and Daily Express. 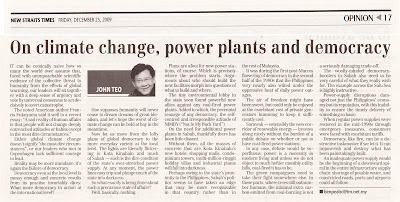 It's quite irritating when we read what he says about the coal power-plant in Sabah (especially for us a Sabahan). Don't you get this? What do he think about us? An idiot? I know Mr. John you have great skills in writing. I wanna ask you one thing, why don't you stay here in Sabah? I know you know nothing about state of Sabah. Coal Power Plants is like ruining the environment. Eventhough we saw on TV some "propaganda" that "konon" the coal power-plant is safe. Like one that being built in Johore. Please read it, and i know you may get annoy for what he saying inside it. I also demand an apology from Mr. Teo for all Sabahan. If not, you gonna get a royal smack-down from me if you're in Sabah. Why there's not many Sabahan bloggers try to fight back? Even the so-called environmental activist just quiet? What are you? Weird.. but if blogging about getting "high" and drunks, wow!! great... or maybe saying about some other people "asses". If you think your love your natural environment here in Sabah, let's fight back... his only John Teo not a God. Hey!! Mr. Teo, if you know nothing about the reality in Sabah, please stop saying that we're like "ungrateful" people. You know nothing.. except your own stupidity a "garbage" can inside your head! !